Phil Hughes debuted for the New York Yankees in 2007, as a 21 year old, making 13 starts that season. He even had a no-hitter heading into the 7th inning of a game against the Texas Rangers, but had to leave due to a hamstring injury. His first full season as a starter wouldn't come until 2010, and it looked as if Hughes was going to be a big part of the next gen in Bronx baseball. He won 18 of his 29 starts, with a 4.19 ERA, thanks to a potent Yankees offense. But it would be the dimensions of the new Yankee Stadium that would ultimately end his career in New York, and find him in Minnesota as a member of the Twins and a shot at resurrecting his career. Hughes would allow 59 home runs over his final two seasons in Pinstripes, tied with R.A. Dickey for the 3rd most allowed, behind Ervin Santana (65) and Jeremy Guthrie (60). 39 of those home runs were surrendered at Yankee Stadium. So here is 27 year old Phil Hughes, left a free agent after two of the worst seasons a pitcher could have and looking for a new home. The free agent pitching market was topped by Masahiro Tanaka, Ubaldo Jimenez, Hiroki Kuroda and Ervin Santana with veterans like Bartolo Colon, Matt Garza, A.J. Burnett, Ricky Nolasco and Tim Hudson all looking for jobs as well. Jeff Passan's Ultimate Free-Agent Tracker ranked Hughes as the 47th best available free agent, and not even a top 15 pitcher. Still just 27, Hughes is a classic change-of-scenery guy. More than one executive has compared him to Gil Meche, who landed a five-year, $55 million deal from Kansas City with a career 4.65 ERA and 96 ERA+. Hughes is 4.54 and 95. The Twins took the plunge on him at three years and $24 million. Hughes was demoted to the Yankees' bullpen earlier this month. He had a respectable 2.85 K/BB ratio in 26 starts, but the extreme flyballer also allowed 23 home runs. There's a 4.00 ERA pitcher in there somewhere, especially away from Yankee Stadium, where he allowed 17 of those longballs. Hughes won't turn 28 until June next year, and as the youngest free agent starter, the former phenom should be a popular one-year deal reclamation project target. 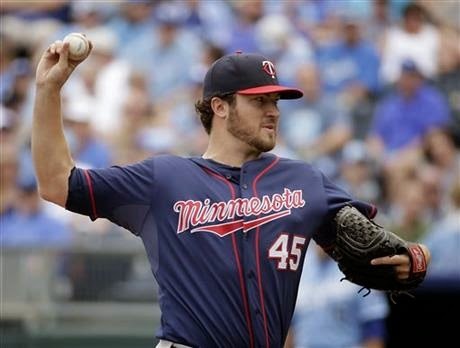 Hughes still has had some issues with the long ball, allowing 3 in a start on June 6th at home in Target Field to the Houston Astros, , and 2 in his first start for the Twins in Chicago to the White Sox. But the Twins provide him with nice run support (5 runs/game) and the team is 10-3 in his 13 starts. Oddly enough, Hughes is 2-2 at home with a 4.25 ERA while 5-0 on the road with a 2.03 ERA. Hughes has faced the Oakland Athletics, Toronto Blue Jays, Detroit Tigers, Baltimore Orioles, Boston Red Sox, Texas Rangers and Houston Astros at home so he does have some excuse. On the road he has stymied the Chicago White Sox, Kansas City Royals, the Tigers, San Diego Padres, New York Yankees (8 IP, 2 ER) and the Blue Jays. So which Phil Hughes will we get the rest of the season? It will be fun to follow, but if he is available in your fantasy baseball league, I suggest adding him for the long haul! Hughes next start comes on Tuesday at Fenway Park. Hughes punched out 8 Sox hitters in 6 innings of work at home allowing 1 run in a 4-3 Twins win back on May 15th. Hughes last 4 starts at Fenway have not been pretty.